The Central Desert Regional Council (CDRC) is continuing to press the Federal Government into paying it more money for child care. It is doing this by media releases, through a hired advertising company, while refusing to answer questions about the issues at Nyirripi, Yuelamu and Atitjere. Readers of the News have raised serious questions about the running of the centres by the council. CDRC has now obtained support from the Central Australian Aboriginal Congress, which fired off a media release of its own, without knowing much about the issues involved. Meanwhile, the questions are mounting. Last week Federal Minister for Social Services Scott Morrison urged the CDRC to “act in good faith” over the closure of the centres, saying his department was working on any problems and “it is disappointing that the Council has taken a decision to close the crèches while negotiations are ongoing”. That means the ratio of staff to children was two to one – or even better, note “up to” – and the cost per child was $16,142 – or, again, more. Council President Adrian Dixon (pictured) is quoted in the release: “This is a ridiculous decision and an attack on Aboriginal families. He was not available for an interview. “Well run childcare centres make a significant contribution to healthy development. Poorly resourced centres are likely to do more harm than good,” says Congress CEO, Donna Ah Chee. Congress is not involved in the running of the centres and Ms Ah Chee says her organisation is merely providing “advocacy” for CDRC. She says: “The coordinator led model proposed by the CDRC, which included the training and employment of local Aboriginal people, builds on the evidence of what is needed to run an effective centre. The Alice Springs News Online contacted Ms Ah Chee for further information, beyond her release, and she agreed to speak with us. We asked her, should unemployed people in the communities volunteer their help in looking after children; should the CDRC partly finance the centres from its own resources; and do mothers who are in employment have a greater need for child care than those who are not. Ms Ah Chee said she had no detailed information about the financial issues involved, the level of employment of the communities concerned, nor the fiscal position of CDRC, nor would she comment on the relative needs for child care centres by employed and unemployed mothers. 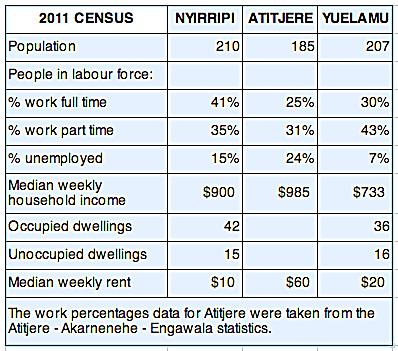 Data from the 2011 Census (see table) show that unemployment and under-employment in the three communities is high. Family income looks adequate considering the level of rents charged. The stats also show that a very high number of dwellings in the three communities are vacant – a possible sign that the local populations are in decline. Heckler, as you appear to suspect, there is no research showing that childcare centres improve child health in remote Indigenous communities. Although most mothers are unemployed and shouldn’t need childcare services, the centres are part of the Intervention and include the rationale of “keeping young children safe”. Like much of the Intervention this rationale is contested. On the other hand, the provision of a centre where mothers can bathe their children and learn to improve hygiene and nutrition would seem to be a positive thing. This is why the coordinator model is touted but the risk is that the centres shift childcare responsibility from mothers. Mothers dropping their infants off so they can go and play cards is a serious risk. Can the CAAC CEO cite the relevant studies / evidence that support her claim that “well run childcare centres make a significant contribution to healthy development”? Evidence from mainstream services isn’t necessarily generalisable to indigenous services. CAAC seems to insist that evidence be provided for initiatives it opposes (eg. the TBL vs ID scanning debate a few years ago) but evidence is not necessary when it supports the CDRC position (give me more). Asking for more money without explaining what happened to the old money is never a good look. We are talking about almost half a million dollars of squandered tax payer funds here, plus millions of capital costs to build the infrastructure. We are told that five locals at each centre are not capable of looking after community babies and toddlers and need to be trained to perform this work. While the local workers may have trouble fulfilling some of their duties, such as teaching hygiene to mothers, it does not seem credible that they could not provide a basic childcare service. But all of the centres have closed. The myth of community run idealism has been exposed – yet again. The truth is that the locals were content to take the money and not perform the work and the council allowed them to get away with it. More money must not be wasted. If the coordinator led model would improve the situation then employ the coordinator with a reduced local staff and use the savings to pay the coordinator.